George W. Barton was born in Sudbury, Massachusetts in 1896. After attending Concord High School in Concord, Barton began his studies in horticulture and agriculture at Massachusetts Agricultural College. The Barton collection includes diaries, scrapbooks, photographs, newspaper clippings, programs, announcements, and his herbarium, and relates primarily to his career at the Massachusetts Agricultural College where he studied horticulture and agriculture from 1914-1918. 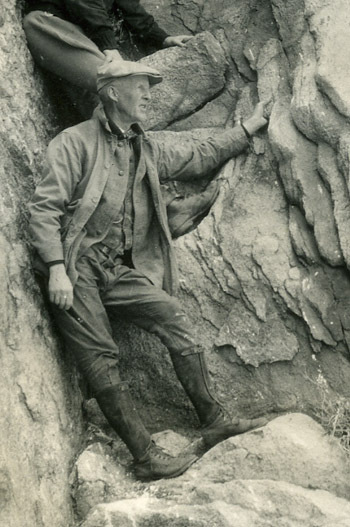 Bernard B. Berger served as the Director of the Water Resources Research Center from 1966 to 1978 and was a world-renowned expert on water supply management and the effects of pollution. Berger was born in 1912 in New York City, earned a B.S. in 1935 from MIT and an M.S. in Sanitary Engineering in 1948 from Harvard. Before coming to the University of Massachusetts, Berger worked as a civil engineer for twenty-five years in the United States Public Health Service, where he researched and advocated policy on pollution control. While at the University, Berger served as the United States’ water resources specialist in the executive office of Science and Technology and worked as a consultant to Israel in 1972 on that country’s creation of the Israel Environmental Service, now the Department of the Environment and as a consultant to South Africa on a similar project in 1975. The year after retiring from the University in 1978, Berger earned an honorary doctorate of science. He died on December 8, 2000. The Bernard B. Berger Papers includes correspondence and reports from his consultancy work with Israel and South Africa. The collection also includes several folders of Berger’s published and unpublished writings, personal and professional correspondence and documents relating to his receipt of his honorary degree and other awards and recognitions. The protistologist Lea Bleyman has conducted research into the genetics, mating systems, and life cycles of ciliates. A former student of Tracy Sonneborn, Bleyman has served as past Secretary and President (2001-2002) of the Society of Protozoologists, and spent many years on the faculty of the Department of Natural Sciences at Baruch College. The Bleyman Papers contain lab and research notes, abstracts of talks and conference materials, along with some correspondence and annual progress reports from Baruch College. The earliest materials in the collection relate to her years as a student in Sonneborn’s lab; other Bleyman material is located in the records of the International Society of Protistologists at the University of Maryland Baltimore County Library. After receiving a doctorate from the University of London in 1962, Geoffrey Boothroyd was invited to join the faculty in Mechanical Engineering at UMass in 1967. An expert in automated assembly, mechanization, and automation, Boothroyd quickly became a leading figure in manufacturing engineering at the University. Active in a variety of professional organizations, he was author of dozens of articles and two textbooks. The Boothroyd collection consists almost exclusively of two of his major publications from the late 1970s: Feeding and Orienting Techniques for Small Parts and Design for Assembly. After earning her doctorate in zoology at University of California Berkeley in 1965 and a two year postdoctoral fellowship at Rockefeller University, Phyllis Bradbury joined the zoology faculty at North Carolina State, remaining there for 31 years. A prolific researcher and expert electron microscopist, Bradbury’s research interests centered on the morphogenesis of ciliates and the fine structure of protozoan parasites of marine invertebrates. Beyond research, however, she became a pioneer in improving conditions on campus for women faculty, students, and staff, leading efforts to secure salary equity for faculty women and to provide mentoring for women faculty at NC State. After retiring in 1998, Bradbury settled in Eastport, Maine. The heart of the Bradbury collection is a significant run of correspondence with Dorothy Pitelka, her dissertation advisor, friend, and long-time colleague at Berkeley, along with some miscellaneous professional correspondence and a series of reprints. In the early Republic, Moses Brown emerged as an ardent abolitionist, a social reformer, and one of the best known philanthropists in his native Providence, R.I. A Baptist who converted to the Society of Friends in 1774, Brown had made a fortune as a merchant, partly in the triangular trade, but a crisis of conscience brought on by the ghastly results of an attempted slaving voyage in 1765 and the death of his wife in 1773 led him to reexamine his life. Withdrawing from most of his business affairs, Brown joined the Society of Friends and emancipated his slaves. He was a founder of the Providence Society for the Abolition of Slavery in 1786 and a strong voice for peace, temperance, and universal education. A small, but rich archive of the personal papers of Moses Brown, this collection centers on Brown’s activities in antislavery, peace, and educational reform and his connections to the Society of Friends between the 1760s and 1830s. In addition to significant correspondence with major figures in early antislavery cause, including Anthony Benezet, George Benson, William Dillwyn, and Warner Mifflin, and some material relating to the Providence Society for the Abolition of Slavery, the collection includes outstanding content on peace activism. In addition to materials from Moses Brown, the collection includes letters to Moses’ son Obadiah Brown and some fascinating letters and manuscripts relating to Moses’ friend and fellow Friend, Job Scott. Born in Rome, Italy, in 1929, Ercole Canale-Parola suspended his studies in 1951 to join his mother who had remarried and moved to Chicago. Continuing his education at the University of Illinois, Canale-Parola earned three degrees in microbiology in quick succession and marrying a fellow student, Thelma. On faculty in the Department of Microbiology at UMass Amherst from 1963 until his retirement in 1994, Canale-Parola’s research on the structure and metabolism of the cellulose cell walls of Sarcina helped him build a reputation as one of the world’s leading experts in the biology of spirochaetes. One of the crowning testimonies to his career was the naming of a spirochaete in his honor: Canaleparolinas. Thelma Canole-Parola died in 2011, followed by Ercole in March 2013. A mixed assemblage of publications, lecture notes on microbial diversity, and specimens from a key figure in microbiology at UMass, this collection is highlighted by Canale-Parola’s notes on lectures delivered by Cornelius B. Van Niel (1961) and 52 (of 58) reel to reel tapes of lectures on microbiology and lab techniques by van Niel. The environmental scientist Robert J. Carton emerged in the mid-1980s as one of the leading scientific critics of fluoridation of the water supply. After receiving his doctorate in Environmental Science from Rutgers University, Carton accepted a position in 1972 with the Office of Toxic Substances in the Environmental Protection Agency, assessing the risks associated with a range of toxic substances from asbestos to arsenic and hexachlorobenzene. By 1985, Carton became concerned about EPA standards for fluoride in drinking water, taking a public stance against undue political influence in framing those standards and insisting that there was no scientific evidence that fluorides prevented tooth decay and that any level of fluoride exposure presented a significant health hazard. In 1992, Carton left the EPA to work for as Chief of Environmental Compliance for the U.S. Army Medical Research and Materiel Command in Fort Detrick, Maryland. Consisting primarily of research, notes, and some correspondence relating to the health effects of fluoridation of drinking water, the collection documents Robert Carton’s nearly two decade long struggle against the EPA and federal government. Also included are transcripts of filings relating to various legal challenges against fluoridation during the mid-1980s. An electron microscopist affiliated with the Sepulveda Veterans Administration Hospital, David Chase (1935-1986) was known for his skill in fixation, staining, and sectioning and for the exceptional quality of his micrographs. During his career, Chase applied his skills to produce thousands of images of the structure, ultrastructure, and morphology of prokaryotes, ranging from filamented, segmented bacteria to the flagellate Giardia, and gram-negative bacteria. In collaboration with Lynn Margulis of the UMass Amherst Department of Biology, Chase worked on a series of papers on the symbiotic flagellated protozoan communities in the hindguts of four species of California termites. The Chase collection consists of over 1,800 TEM photos and their negatives, 134 polaroid prints, and about half a linear foot of loose notes and a register.